Welcome to Inspire Us Tuesday #6. We are tail-wagging thrilled to have you here to party with us again this week. Last week we had 94 great links submitted. Thank you for taking our idea to heart and submitting your projects to inspire everyone! Did you know that dogs can have diabetes? Many people believe that dogs that are diagnosed with this disease cannot live long and happy lives. Last we we wrote a post about Caring for a Diabetic Dog, so that our friends that are afflicted with this disease can enjoy healthier lives. 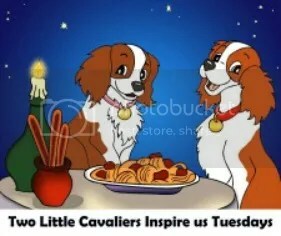 Are you ready for the Inspire Us Tuesdays Features? The summer passed by very quickly, but we are not too sad about school starting now that we have seen these great Back to School Notebook Nails by Kids Activities Blog. We think nail art is really neat and are in awe of anyone that can do it. When we saw How to Make a DIY Princess Dog Bed From an Old Drawer by Do It Yourself Fun Ideas. Mommy said we would have to ask grandpa Two Little Cavaliers to make us something like this because he has all the tools and wood to make it and grandma can go looking at Yard Sales for an old dresser. When we saw this recipe submitted last week we knew that it would be something that would be cooking at our house in no time. We had a big bag of all sorts of mixed beans that we just had no idea what to do with and now we do. 15 Bean Soup submitted by Crystal and Co. and our mouths began to water right away. Bean Soup with Cornbread sounds like a yummy way to welcome the crisp fall air and falling leaves. Of course the one cooking in our house will be Vegetarian that is why this party is called Inspire us. It is not all about recreating exactly but using what is shared to inspire other creations. It should come as no surprise that we are clamoring for a batch of these Frozen Banana Peanut Butter Holes by Sugar the Golden Retriever. We know that if our friend Sugar gives her paw print of approval that it must be yummy. Kids Activities Blog always has such fun ideas! These Vet Pretend Play Printables are fantastic. We know that the little ones will love playing with these so make sure to run over and print them out to add to their toy box! We are looking for things that inspire you and will inspire our readers, fans, and friends each and every Inspire us Tuesdays. Please no giveaways, etsy shops or links to anything you are selling. 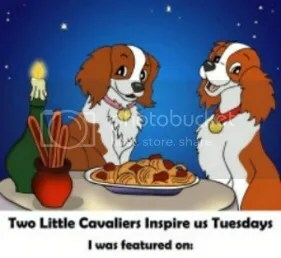 Please note that by linking up to Inspire Us Tuesday you are granting us Davinia and Indiana the Two Little Cavaliers and our assistants (we don’t have thumbs so it gets hard to type), permission to feature your post on our social media accounts or on our Blog if your share really inspires us. We will credit you and link back directing our readers, fans, followers, and their people to check out your blog. We can’t wait to see what you have to share with us this week! Don’t forget to visit the other bloggers as you are linking up. That is what makes a party so much fun! Oh and make sure to spread the word and tell your friends. You never know who is looking for a little inspiration or has something special they would like to share with others. Thanks for stopping by and leaving some Inspiration! Thank you for the invitation and for hosting! Jenny @ Women With Intention recently posted..Form A New Habit In September (The Challenge) Begins Today!